Sitting back, relaxing and getting beauty sleep is just one part of your trip – but it’s a very important part! With so much sightseeing and shopping to do in Liverpool, you’ll want a superb place to stay at the end of the day. We recommend choosing an accommodation that suits your needs and luckily Liverpool has plenty of private apartments to hire for short and long stays. Located in Liverpool’s vibrant centre, Base at Cumberland Street is ideally situated on the doorstep of many bars, clubs and quality eateries. Liverpool One and the famous Cavern Quarter are a 5-minute walk away and the Royal Albert Dock with its selection of tourist attractions, museums and galleries is a 10-minute walk. Liverpool’s Theatres and Cathedrals are within easy reach, and the Echo Arena and Convention Centre are a 15-minute walk. For football fans, Anfield and Goodison Park football stadiums are just a 10-minute bus or taxi ride away. Base operate spacious, 1 & 2 bedroom serviced apartments at this location. All serviced apartments feature stylish well-equipped kitchens with laundry facilities, along with widescreen TV’s and living spaces. With bespoke, contemporary interiors our Cumberland Street apartments offer the perfect space for groups of friends enjoying Liverpool’s thriving nightlife. Located in the heart of the city, Base at Duke Street is just a 10-minute walk from Liverpool One and on the doorstep of Liverpool’s magnificent Cathedrals. The historic Chinese Arch is a stone’s throw away and Liverpool’s Royal Albert Dock, Echo Arena and Convention Centre are a 15-minute stroll from the apartments. Looking for nightlife? Liverpool’s famous Concert Square and trendy Baltic Triangle are also within easy reach. For football fans, Anfield and Goodison Park football stadiums are just a 10-minute bus or taxi ride away. Our largest site, Base operate a variety of 1, 2 & 3 bedroom serviced apartments at this location. For a luxurious stay, opt for a penthouse with breathtaking city views. All serviced apartments feature stylish well-equipped kitchens with laundry facilities, along with widescreen TV’s and living spaces. With bespoke, contemporary interiors our apartments offer the perfect place to unwind for families, leisure and corporate guests alike. Perfectly situated in the heart of the city, Base at Sir Thomas Street is a stone’s throw from The Metquarter and Liverpool One shopping centres. Liverpool’s famous Cavern Quarter, with its many restaurants and bars is just a few minutes walk away – whilst The Cathedrals, Museums and Theatres are within easy reach. Anfield and Goodison Park football stadiums are a 10-minute bus or taxi ride away and Liverpool’s Royal Albert Dock, boasting several tourist attractions is a 10-minute walk. For concert goers, The Echo Arena and Convention Centre are just a 15-minute walk. Base operates a choice of room types at this location; standard double rooms with en-suites, 3- bedroom apartments and for a superior stay, opt for a stunning 2-bedroom penthouse. For an apartment with the WOW factor, choose our Cablehouse property, located adjacent to the Sir Thomas Street block. All serviced apartments feature stylish well-equipped kitchens with laundry facilities, along with widescreen TV’s and living spaces. With bespoke, contemporary interiors our apartments offer the perfect place to unwind for families, leisure and corporate guests alike. Perfectly situated in the picturesque Docklands area of Liverpool, Base are pleased to offer a choice of locations within this stunning UNESCO world heritage site. The Docks apartments are positioned in the heart of the Royal Albert Dock with an array of quality eateries, shops and tourist attractions on its doorstep. The Echo Arena and Convention Centre are a stone’s throw away and Liverpool One shopping centre is just a 5-minute walk. Slightly further afield, at the stunning marina is the 3-bedroom townhouse, surrounded by a coastal walking path and envious marina views. Base operate spacious, 1, 2 & 3 bedroom serviced apartments as well as a 3 bedroom townhouse within this site. For a luxurious stay, opt for a penthouse with breathtaking Dockland views. All properties feature stylish well-equipped kitchens with laundry facilities, along with widescreen TV’s and living spaces. With bespoke, contemporary interiors our apartments offer the perfect place to unwind for families, leisure and corporate guests alike. If you fancy somewhere to retreat nearer the countryside then look no further than the Roman city of Chester in Cheshire. Base operates 3 different room types in Chester; 1 & 2 bedroom apartments and compact double rooms with en-suites. All serviced apartments feature stylish well-equipped kitchens, along with widescreen TV’s and living spaces. With bespoke, contemporary interiors our apartments offer the perfect place to unwind for families, leisure and corporate guests alike. Base City Road is located near a beautiful canal, above a traditional English Pub which serves food and plays live music. The Forum Shopping Centre, Chester Cathedral and the city’s many eateries and bars are just a 10-minute walk away. Chester Racecourse, the historic city walls and the Roman Amphitheatre are within easy reach by foot. Or for an even more exciting stay, why not hire a campervan or motorhome and take a tour of rural Lancashire and Cumbria? Easirent sister company, Easicampers offer luxury, new campervans and motorhomes for hire over short and long duration rentals for a slice of the price than a hotel. Cumbria, a neighbour to Scotland, sitting in the North West close to the Isle of Man, encloses the stunning Lake District National Park. The Lakes are such a gigantic attraction to visitors, it’s easy to let them dwarf the entire county. The truth is that around half of Cumbria is beyond the Lakes, including the border city of Carlisle, a host of idyllic coastal towns and Penrith’s famous caves. The best experiences in Cumbria balance both sides of the coin, lavishing attention both on the out-of-this-world beauty of the Lake District, with its 16 incredible bodies of water, and the rest of what Cumbria has to offer. The first advantage, and everybody’s favourite one is that apartments cost much less to rent than a hotel room! With cheaper rates, you’ll have more spending money for actually seeing the city and there are less hidden costs than you’ll encounter in most hotels. And not only will you find apartments are cheaper, but you are often paying less money for a lot more space. Another thing to keep in mind is that the longer you stay in an apartment, the better the deal (not always but most often). By renting an apartment you are likely to have much more choice when it comes to what part of town you’d like to stay in. Whereas hotels in a city tend to be concentrated to one little area, you’ll find holiday apartments all over town. So if you are really keen on a particular area of the city you’re planning to visit, then you probably won’t struggle to find an apartment there. Unlike a stay in a hotel, with an apartment, you’ll have your own kitchen to use at mealtimes. So whether you just want to make a cup of coffee and a bowl of cereal at breakfast or are planning a huge feast one evening, you will have a kitchen there ready for whenever you need it. In hostels, they often also have a kitchen, but you would have to share it with 20 other people which can be frustrating. Another added bonus of cooking at home is that you’ll save even more money. Restaurants can be quite pricey in some holiday locations so it’s nice to have the option of eating on for some of the nights. You are a lot more likely to meet some interesting locals during your stay in an apartment. Perhaps when waiting for the lift or when crossing paths at the front door, you’ll be sure to bump into some locals during your stay. It’s the locals that really make a city what it is, so it’d be a lot more fun to meet them than to meet some tourist with a giant map and bag full of souvenirs at the hotel. The last advantage is that many of the holiday apartments out there have handy amenities that you often won’t find in a hotel. Things like washing machines, televisions and ironing boards. That you had always assumed are were simply not meant to be a part of the holiday experience. Are now there and waiting for you in your holiday apartment! And if you are fortunate you’ll have kitchen colours with dark cabinets. 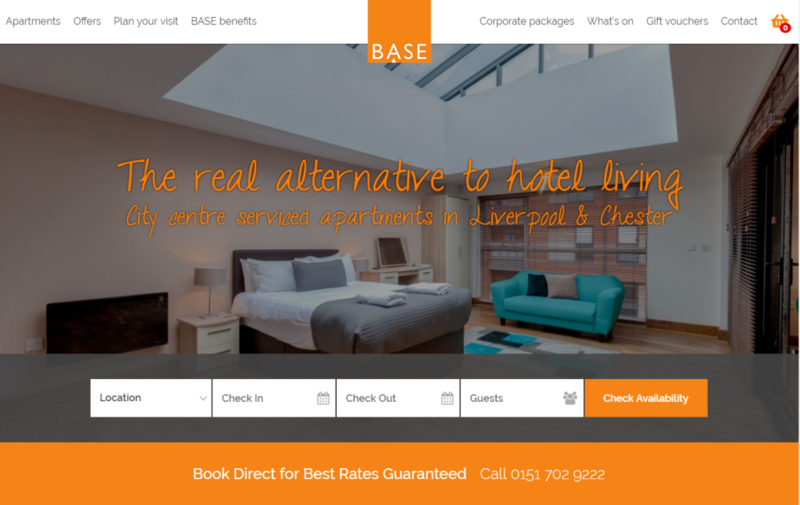 We recommend using BASE Apartments to book your accommodation but you may wish to check out TripAdvisor for the top 10 rated accommodations in Merseyside and Cheshire. Airbnb can be handy for longer stays and come with the luxury of being fully insured for the duration of your rental. TravelSupermarket and Kayak are also great comparison tools for booking and browsing different types of accommodation for your trip. When is best to book? Spring – It may be cold but there are plenty of reasons to get out and about in the city over Spring. You can take a Hot Chocolate Tour and find all the best spots to sample the many coffee shop hangouts and cosy pubs. Summer – What’s not to love? The sun is out and there are plenty of things to enjoy such as our beaches, the waterfront, the festivals, flower shows and city centre attractions, the rooftop bars, outdoor eating areas, it’s a plethora of pleasure! Autumn – There are so many parks and green spaces across Merseyside, you could visit a different one every day for a fortnight, and they offer up some breath-taking scenes during Autumn. Grab the kids, dogs, scooters, your loved one, or a bunch of mates and go for a wander in the cool crisp air and take some shots of your own. Liverpool has lots of parks, including the beautifully huge Sefton Park where you can go for a long walk and see the leaves change colour. Also, the sunrises and sunsets down on the river are particularly spectacular at this time of year. The city skyline looks incredible with the autumnal sunrise backdrop and our friends over on the Wirral get the best view. Feeling energetic? Why not take your morning jog or evening stroll over at New Brighton and watch the sun bathe the city in light, or grab a coffee and watch the sun go down from Marine Point. You won’t regret it. Halloween is a great time of year to visit thanks to the Farmaggedon event and our Day of the Dead parade in the Baltic Triangle each year. Bonfire Night in Liverpool is another great family event that over the years has seen some incredible spectacles take place. From River of Light, last year to Sefton Park and Newsham Park displays that thrill the masses who’ve wrapped up warm and stayed up late. The city is shrouded in fireworks fog and that smell returns…..you know the bonfire night smell? Ahhh that’s when it’s properly Autumn! Winter – Liverpool is a beautiful city at night, lit up in twinkly lights. When the days turn dark, the city wakes up. Christmas time sees the return of the Christmas Markets full of good food, hot drinks and gorgeous gifts. There is the annual Ice Festival, the entertaining Santa Run, of course, Liverpool ONE offers late-night shopping. Not to mention all the pubs start serving the Liverpool favourite dish – Scouse! It may be colder in Winter but that doesn’t mean your trip will be any less wonderful! This post is in partnership with BASE Apartments. You can visit their website for more information and get a quote by clicking below.